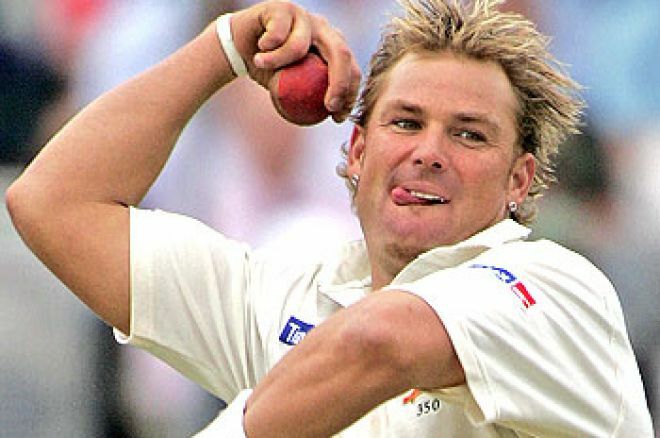 Aussie test cricketer Shane Warne is the latest non poker player celebrity to announce they are a sponsored poker professional. The legendary Australian bowler has reportedly been snapped up by Pacific Poker to play in a series of events now that he has retired from cricket. By all accounts he is no mug either, having been coached by 2005 WSOP Champion Joe Hachem. Warne also previously set up a very successful charity poker tournament which raised over $500,000 last year. Warne retired from international cricket last year and is looking for other avenues to pursue in life: "Nothing will replace the 20 years of cricket in my life but there are a lot of similarities (with poker). It's a game of skill that has a lot of analogies to cricket. You have to be very, very disciplined. I'm really excited. Hopefully this will replace the competitive spirit that I had with cricket," he said. Last year we brought you the surprising news that tennis legend Boris Becker had been picked up by Pokerstars in its team of sponsored players. This looks like it is going to be the norm from now on in poker, as many retired sports stars seem to be fancying their chances at cards. Football legends Tony Cascarino and Teddy Sheringham have both established themselves as serious players at the table, both of whom have received sponsorship deals in the past. Last month Phil 'The Power' Taylor revealed his poker ambition to win the WSOP main event and almost all the big snooker players have won big at poker: Steve Davis, Ken Doherty and Matthew Stevens all equally as respected at the poker felt as the snooker green. So who is the next retired sportsman to be announced as a sponsored professional while the rest of us grinders will never get a look in? Mike Tyson could probably do with the money and we doubt even Tony G would dare throw a single dialogue of trash talk in his direction. Tiger Woods could clean up, even if he didn't win at the cards he could fleece Daniel Negreanu when he suggests a golfing prop bet. If Tim Henman could repeat his tennis form at the poker table there would doubtless be a queue to play against him. You can join Shane and possibly hundreds of ex sporting icons at Pacific Poker. With a $100 bonus just for signing up, you'll be bowled over.